425 CFM Air Compressor Rental – Sullair 425 CFM, is available for rent in Rochester NY, Ithaca NY and the entire Western New York region from the Duke Company. 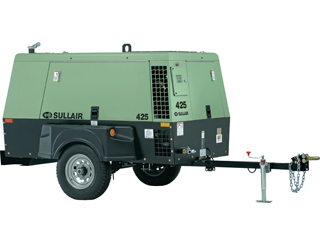 The Sullair 425 CFM air compressor is renown for its efficiency and reliability. Powered by a John Deere engine, generates 425 CFM at 100 psig or 12.0 cubic meter per minute at 7 bar. The unit is equipped with highway towable running gear.